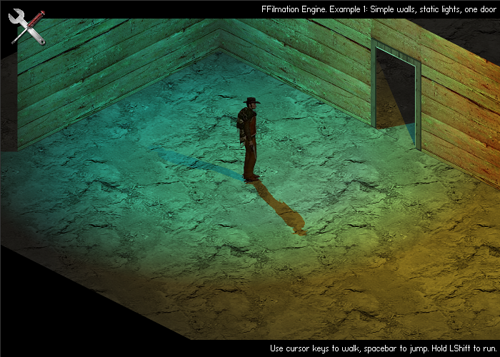 The FFilmation AS3 Flash Isometric Engine has been released into the wild. Jordi Ministral has been generous to watch his creation grow and evolve with the help of the open source community and the flash community is one of the best open source communities out there even though the core (adobe flash) is still closed. Open sourcing is one of the best ways to market test your skills really and this engine has much anyone can learn in making isometric engines for flash. You can see our first post on this great engine here. I have been one upped by mr. doob! 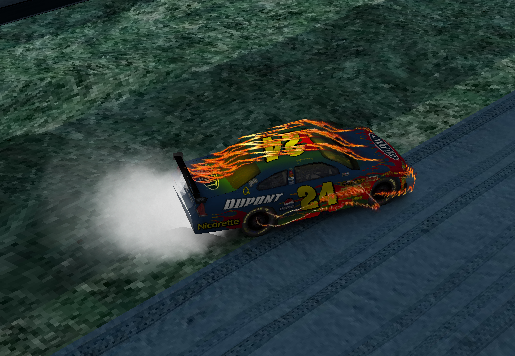 I did a little nascar like RC pro am like prototype in march ’07 when the pv3d kit showed up on my screen and I was hooked like most suceptible flashers who have longed for 3d in flash! Only my version is like Nintendo64 and his is like xbox360 with updated effects and physics kits and some doob magic. All these are based off of, of course the original race car driver in Papervision and its creator Carlos Ulloa (Adobe should be paying this man). To the feature! This is a sweet game by mr. doob, called burn and brag for Nascar. Now I don’t’ particularly like Nascar all that much but who doesn’t like to peel out to some fiddlin’? I mainly do Nascar stuff because it is highly marketable and like the only answer most ad agencies have for getting the southern us markets it seems, that and c-o-u-n-t-r-y mu-si-c (must be said at a slower rate). But I digress, this is a perfect mix of advertisment, game play, fun and experience. It is fast, simple, and playable. Exactly the simplicity and smoothness needed of gameplay and playback. 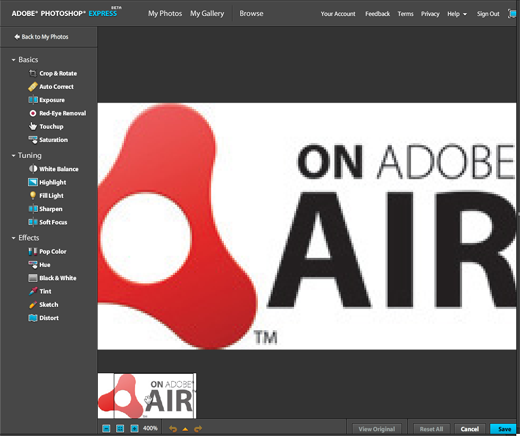 Great ad work but it also gives something fun to do and best of all it is built in AS3 flash with a plethora of libraries from the flash as3 community. It would be cool to see a post on how he did the replays with tweener – I imagine just a series of points collected with car state (current position state) and then just play them back with a call back or time delay. You’d have to capture alot for smooth playback without laggy movements. 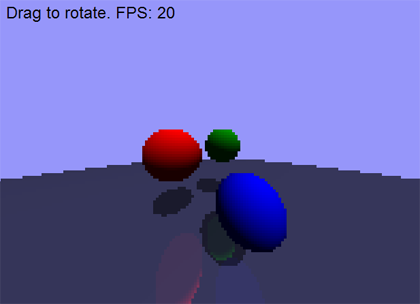 I am working on multiplayer games with this same issue for a current project. Game on! The question is when will this be SOTD or SOTM at thefwa.com? If there ever was a proof that more intense applications like word processors and image manipulation software are capable of being built and some aspects even better than their desktop counterparts with flash and flex then Scrapblog, Buzzword, Picnik and Photoshop Express are that (in fact Photoshop Express is a direct competitor with Picnik it seems…). The service will go live in beta test mode on Thursday. Mack said that the company intends to use the test period as a way garner feedback from customers.Adobe intends to offer more features to consumers who pay a yearly fee. 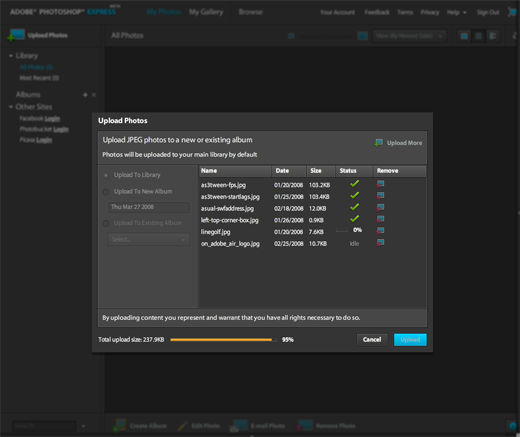 Some planned features include a printing service, more storage, support for audio and other media, and the ability to read additional image file types (the service works with .JPGs now. 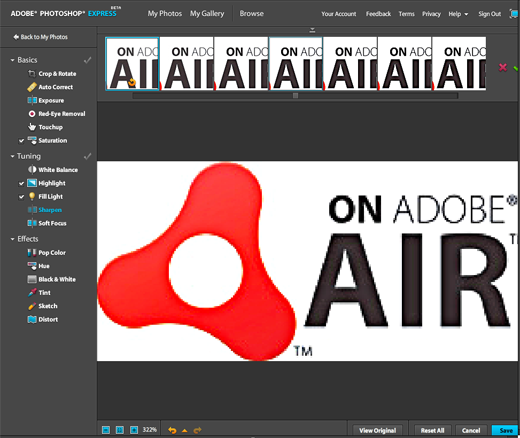 )Adobe also plans to build an offline client using AIR (the Adobe Integrated Runtime) so that people can edit photos offline, executives said. I have officially been sucked into the Python vortex. I recently have really been digging IronPython, Jython and good old plain Python but have not ventured here yet. Google (They employ Guido), Microsoft (IronPython) and Sun (Jython) are all becoming infected pythonistas as well. But this is just too cool, Python to AS3 code with flex-pypy. This project is very young but could be fun, source at Google Code. Haxe has a similar premise where it can compile to Flash6-9 versions of actionscript 2-3 which makes for a system with better reach. Python code for this is lots of fun and very flexible. Python is becoming a baseplane language and one great language for transcending platform lock-in. Just got word of this great isometric engine similar to the Alternativa engine or zenbullets but with plans for open source. I checked out the demos and it looks well done and is pretty responsive. Once you get to heavy lighting it can draw a little slow (the cowboy becomes more John Wayne like with slow drawls) but this seems like a great base for an isometric AS3 engine. 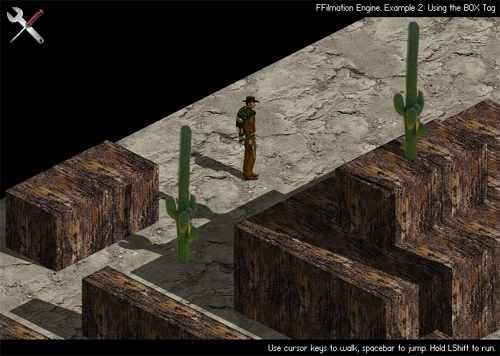 The FFilmation Engine is an AS3 isometric programing engine, focused mainly on game development. The aim of the project is providing a robust development platform, where game designers can work on the game’s details and forget about the render engine. It is intended to be really usable from a “real production scenario” point of view. Unfortunately there is no name associated with the project yet, I think it would be wise to let that be known. The author has some info on the level structure of files and 3 great demos. Have a programming interface as small and easy as possible, no matter how complex the internal code is. From a software engineering point of view, the OO structure may not be as correct and clean as it could have been. It is not messy, but several decisions where made that improved performance and simplicity at the cost of breaking some “good OO programming” conventions. Rendering performance is a major concern when designing all the algorythms. Some of them have been rewritten 4 o 5 times from scratch until one fastest enought was found. If it doesn’t perform well, it is not usable. We’ve all seen several impressive actionscript demos that look really cool and invite to be used in your next project. But then if the effect takes 90% of your CPU, you can’t build anything on top of that. Graphic designers should be able to work on the application’s ( game or not ) environments without any programming skills, visually, and with almost immediate previews of what they are doing. Using the engine should be fun to some degree. If you have this terrific engine and adding a wall to your dungeon means you have to write 10 lines of OO gibberish, lazyness will eventually win you over. If art directors can draw and place the walls and lights an floors and enemies and see them appearing onscreen, you have more chances of reaching your deadline. 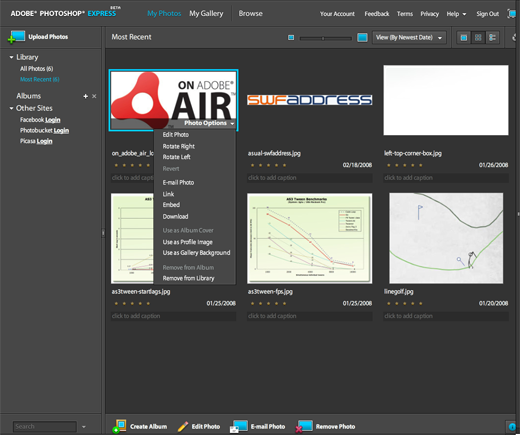 Flash has built-in drawing and animation tools. You should be able to take advantage of them !! All this is important because in reality projects depend on limited resources. Resources are money and time, but also the enthusiasm of indie developers or single individuals doing stuff “for fun” in their bedrooms. Projects, specially the “for fun” ones, have more chances of completion if the production process is gratifying to some degree. One engine capable of handling several isometric scenes of different complexities. Flat textures. Paint your grahics directly into flash. 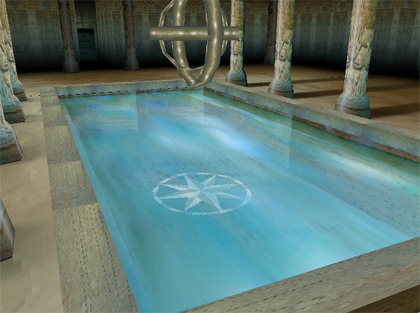 Walls, floors and celings are edited as 2D graphics and projected by the engine. Elements and animated characters can be animated via flash timeline, no need for complex programming. 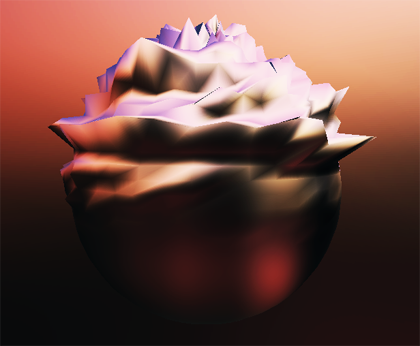 Dynamic lighting, global lighting, real-time shadow projection. 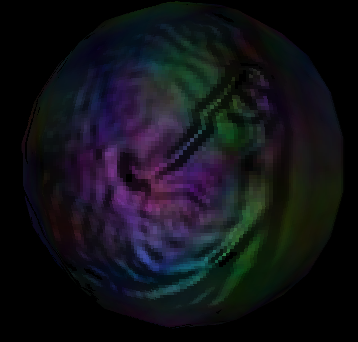 Multiple lights from multiple sources affecting the same objects. 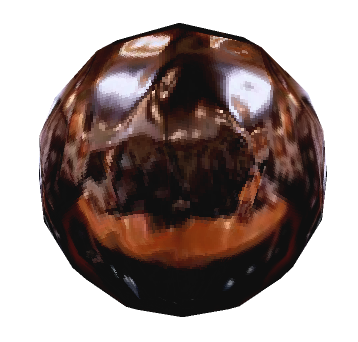 Bump-mapped surfaces. Still somehow buggy and a serious performance killer, but already there. An extendable material interface. MovieClip materials, autotiled materials, procedural materials. Built-in collision detection. No need to program complex coordinate comparisions, simple listen to COLLISION events generated by the engine. I plan to make the engine open-source, but I’ll wait until I have a release “solid” and documented enough. I am looking forward to more updates and to find out more about the author. We have some great engines underway in ’08 for AS3 and it looks to be a very fun year in that aspect. 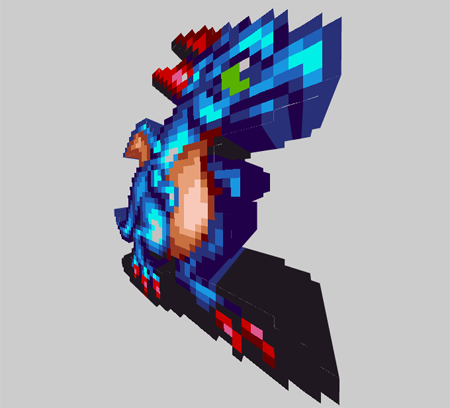 Because it is an isometric engine is is not true 3d but sprite based animation. However with planes and objects other isometric 3d objects can be built such as walls, boxes, buildings, cubes, etc. I wonder if there are any toolkits being used or if this is all custom built? Keep your eye on this space. It is very similar to the Alternative Engine.